Broadcaster Jo Scott will host this year’s Royal Television Society Northern Ireland (RTS NI) Student Television Awards which will take place in the Black Box, Belfast on Tuesday 26 March 2019 with UTV’s Eden Wilson delivering the keynote speech. 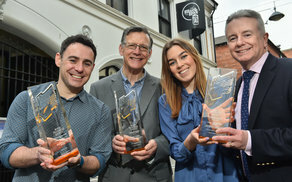 In partnership with Northern Ireland Screen, the RTS NI Student Television Awards recognise the importance of education within the growing creative industry sector in Northern Ireland. “This is the 6th year of our Student Awards and we have consistently showcased brilliant talent at post and undergraduate level in all manner of disciplines that go into telling great stories, highlighting the exceptional talent emerging from our third level colleges. There are 5 Awards categories for Animation, Drama, Entertainment, Factual and Short Form with an additional Craft Award recognising particular skill in camera work, editing or production design. The winners of the Student Awards will go forward to the national RTS Student Media Awards, which will be held in London later this year.